Wall mounted air vents are designed to direct airflow in one or two directions. They maybe used in either a supply or return air application and can be installed in ceilings or walls. It is a great option for filling your remodeling or building needs. 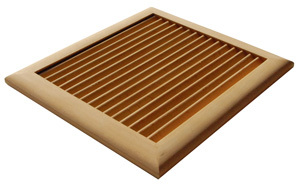 Made of solid wood from domestic and exotic, these vents give warmth to your home. These wall mounted vents can be also used as speaker grilles, lighting grilles or for other decorative architectural applications.